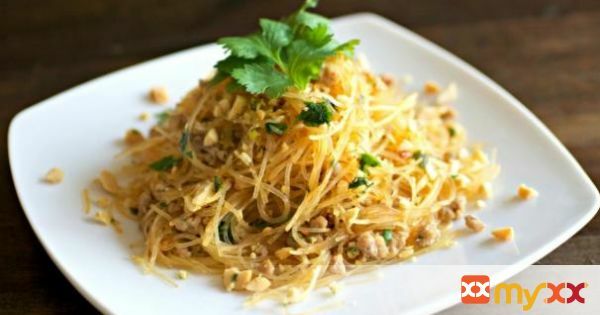 A light and refreshing glass noodle Thai salad with the delicious flavors of sour, spicy, salty, and sweet all in one. Ready in less than 20 minutes! 1. Place the noodles in a large bowl and cover with boiling water. Let soak for at least 10 minutes, or until noodles have softened. Drain and use scissors to cut the noodles into 2 inch pieces. Set aside. 2. In a large skillet, lightly dry toast the peanuts over medium heat. Remove, let cool, and roughly chop the peanuts. Set aside. 3. In a small bowl, combine the soy sauce, fish sauce, cilantro, lime juice, rice vinegar, garlic chili sauce, and green onions. Set aside. 4. Using the same large skillet, lightly brown the ground meat over medium heat for about 5 minutes, or until cooked throughout. Turn off the heat. Add the small bowl of sauce and the noodles to the cooked meat in the skillet. Mix well. Add the peanuts and adjust the seasonings, if desired. 5. Optional: Can add cucumber slices, tomato wedges, and chopped lettuce for garnish. 6. Serve warm or at room temperature. Refrigerate any leftovers and consume within 1-2 days. Enjoy!